Amtrak Unveils Its Vision For 2040: Travel From D.C. To New York City In 96 Minutes : The Two-Way In Philadelphia today, Amtrak's president presented an optimistic view of what high-speed rail could look like in 2040. In Philadelphia today, Amtrak unveiled "A Vision for High-Speed Rail in the Northeast Corridor." There's plenty of stuff to swoon over -- or daydream about: Washington to New York City in 96 minutes?! Manhattan to Boston in 84 minutes?! 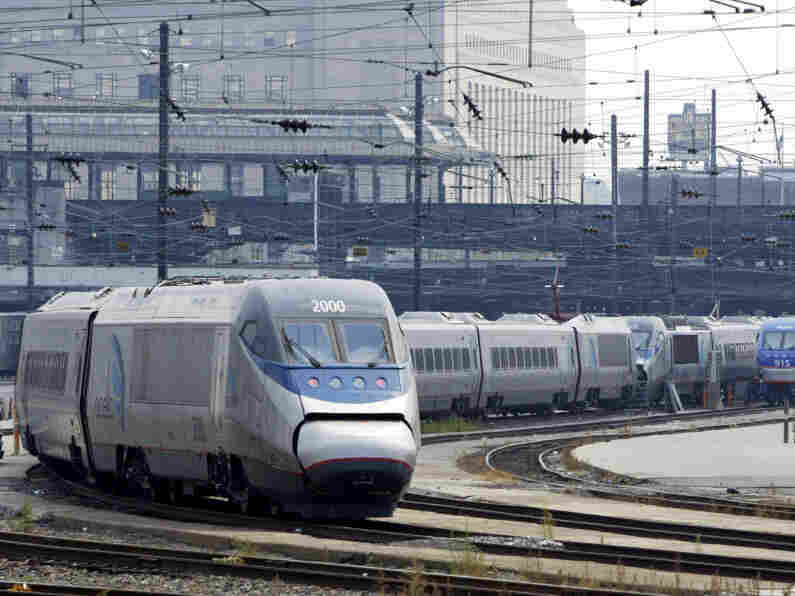 ...high-speed train ridership would approach 18 million passengers with room to accommodate up to 80 million annually as demand increases in the years and decades that follow. Departures of high-speed trains would expand from an average of one to four per hour in each direction, with additional service in the peak periods, and total daily high-speed rail departures would increase from 42 today to as many as 148 in 2040. The service would generate an annual operating surplus of approximately $900 million and its construction would create more than 40,000 full-time jobs annually over a 25-year construction period to build the new track, tunnels, bridges, stations, and other infrastructure. Again, it sounds good. But is it feasible? Matt Yglesias says that the plan's price tag -- $117 billion -- "highlights the central problem with our current approach to rail." The Obama administration’s high-speed rail initiative is not only pretty stingy, it’s also spread incredibly thin because that’s what you get when you need to frame initiatives that can be approved by a congress based on representing distinct geographical areas. Any kind of national legislation that would raise $117 billion for northeast rail service would need to also spend a ton of money on rail service elsewhere in the country where the case for massive investment is much weaker. We’re essentially destined to be perennially under-investing in the northeast corridor and a handful of promising city pairs (Tampa-Orlando, Portland-Seattle) scattered around the country while sporadically over-investing elsewhere.